When it comes to convenience and making sure your kids have a wholesome snack, cheese sticks can truly be a mom's best friend. They have major kid appeal and when your little ones are on the go, cheese sticks are an easy to hold, protein-rich food (that won't make a total mess!). Whenever my kids are hungry in between meals, they know where to go_ straight to the drawer in our fridge which I always keep stocked with a healthy supply of cheddar and mozzarella sticks. My kids will also eat pizza pretty much any time of day, but it's not exactly a food I want them running around the house with. I don't know why, but one day I thought about marrying the convenience of cheese sticks with pizza -- kind of a mess-free meal for active kids. The results were pretty popular with Kenya and Chloe. All I have to say these days is, "who wants a Cheesy Bread Stick," and before I can even offer one to my kids it's been grabbed out of my hand. 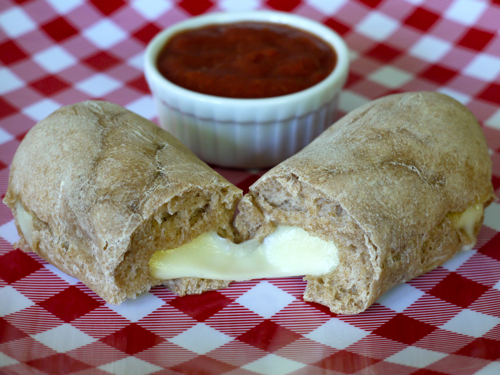 I wouldn't say this is the healthiest recipe on weelicious, but I sure as heck don't have to twist anyone's arm to take a bite of the crusty pizza dough filled with oozing cheese. Sometimes that's reason alone to make them! 2. Shape dough into a rectangle, about 10 x 6 inches wide, and cut into 6 rectangular pieces just big enough to wrap around the cheese stick. 3. Take one cheese stick and place in the middle of the rectangle of dough. Fold the ends over the cheese, then fold over the sides, pinching as you go so the dough sticks together. Roll the dough to evenly shape into a cylinder. 5. Serve with pizza sauce for dipping. * To spice this recipe up for parents, drizzle some olive oil on top of the cheese sticks followed by a sprinkling of some garlic powder, sesame seeds and/or salt before you bake. This is a great idea! Simple for me to make, and I'm sure the kids will love it. A restaurant in the food court of the college I used to attend had these... (The restaurant was called Connie's Pizza and they were called Bosco Sticks) but I never tried them. I love breadsticks and cheese so these would be awesome! This sounds great....can these be frozen? Would you freeze pre or post baking? They're awesome to freeze pre baking! Genius! I've already seen ways of adapting them further for adults. Thanks for this recipe! I swear you were reading my mind! I was just thinking how could I make some yummy cheesy bread! Thank you! That is great recipe and a great way to get kids to get protein and calcium. Just made these for lunch and all of the cheese melted out of the dough onto the parchment paper :( The dough was hollow inside. Where did I go wrong? When I pushed \"like\" on this. It posted it to my facebook page. Next to it there is a big frown face. So now my friends think I posted this saying I don't like it. I hope you get what I am saying ;) I just don't want people to miss out on this great recipe. Loving this idea, just brilliant. It seems pretty healthy to me, especially if it's whole wheat dough. I gotta feeling my husband would love these on a Saturday, too busy working around the house to stop, kinda day. Brava! These might be good for sending in lunchboxes, too! I think I'll see how well they work with my gluten-free pizza crust recipe.